Contrary to popular belief, jet engines are not hard to make. In just a few minutes, you will be on your way to starting your own personal NASA program! It all begins with the glass jar jet engine! Long matches will keep you a safe distance from the flame. 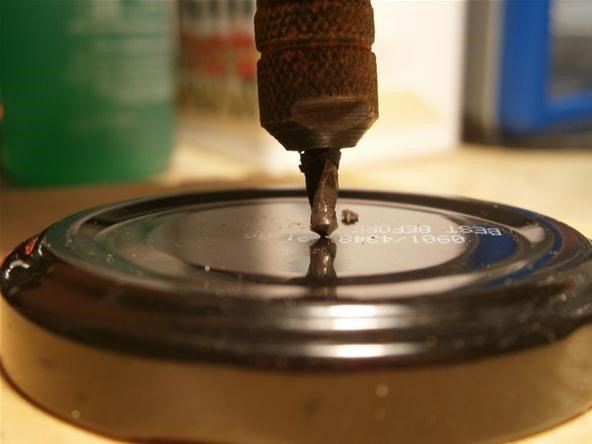 Begin by removing the screw-on lid from the glass jar and placing it onto a piece of junk wood, cardboard, or something else you don't mind drilling a hole into. The wood will stop the drill from scratching the table, too. Drill a small hole at the center of the cap. It's better to start out really small than too large. Later on, you can experiment with different hole sizes to see how they affect the performance of your jar jet engine. If you don't have a drill, a hammer and nail will work fine. 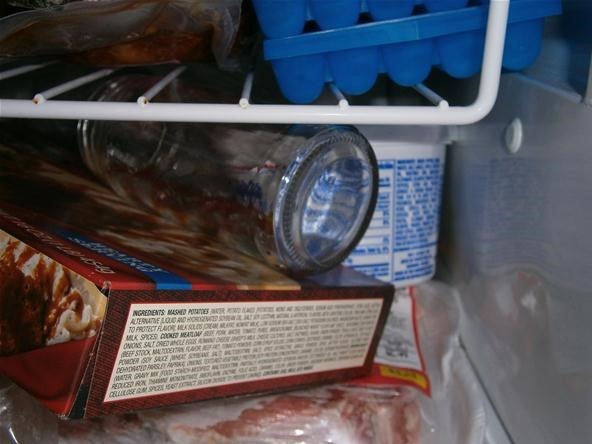 Place your jar in the freezer for a few minutes. This will decrease the likelihood of your glass jar cracking due to overheating. Wait until the glass frosts, then remove the jar from the freezer. Place the frosty glass jar in a safe, non-flammable environment. I set mine on the shell of an old VCR that I sacrificed to the scavenging gods. 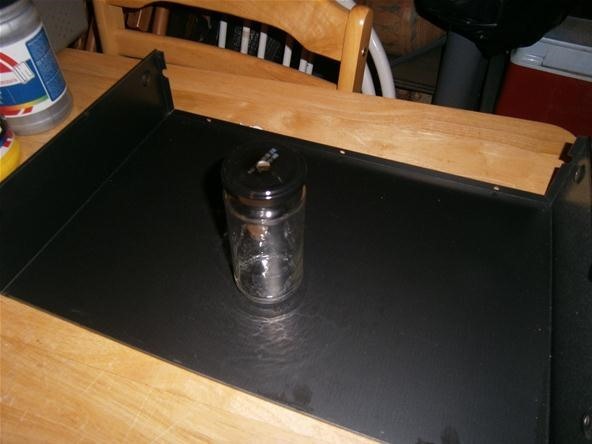 The metal shell will keep heat and broken glass off of the table. Pour a tiny bit of methanol into the jar, as shown in the following photo. Just a spoonful or two will be enough. Make sure it is on really tight. Attach the match to the end of your ruler or stick. Light the match away from the jar. With the match extended away from your body, bring the flame to the opening in the cap. Before lighting your jet, put on safety goggles and make sure all sentient beings are well clear of the jar. 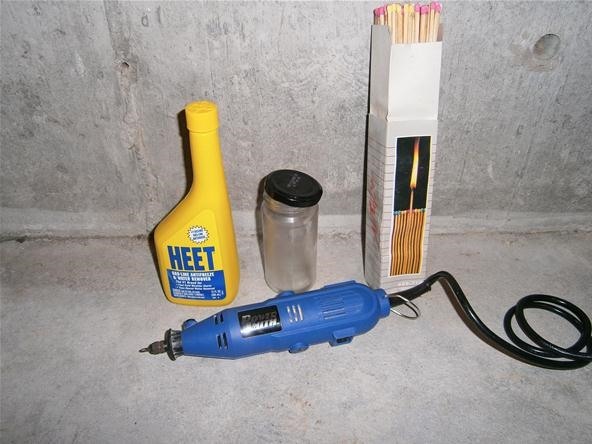 Always have a fire extinguisher on hand when experimenting with fire. Be sure to let the glass cool down for a few minutes before touching it again. 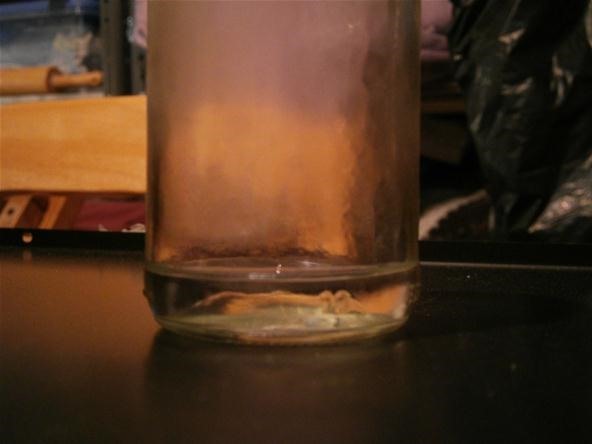 Part of the methanol that's trapped inside the glass jar floats around as vapor. This vapor flows toward the opening at the top of the jar. When the match flame meets the vapor, it ignites the entire vapor cloud. 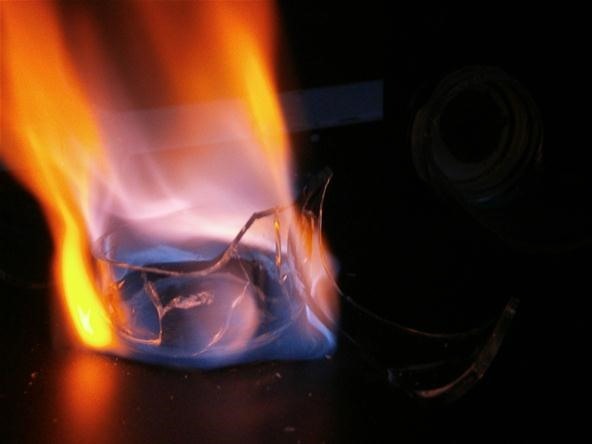 The combustion consumes the oxygen in the jar, while more oxygen is sucked in through the lid. This results in the upside-down tornado shape of the jet flame. 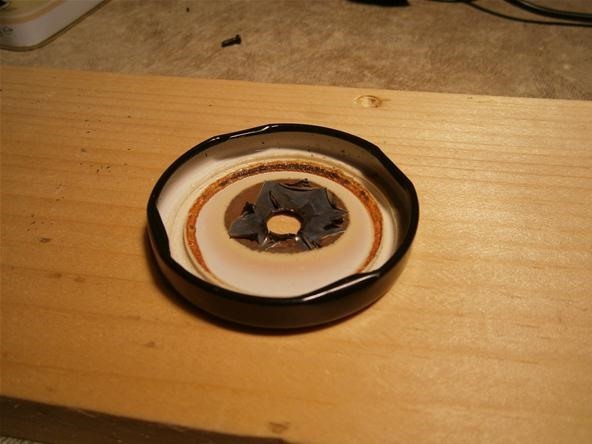 After the first run, the inside of the cap was burned in a circular pattern! If you look closely, you will see that the burn is slightly lopsided. The hole is likely off center, so the escaping fire oscillates around the opening. The constant heat caused this jar to break after three uses. Now, try making your own miniature jam jet engine at home and share your experience with the community! Make sure to post any pictures and videos that you take of your valveless jet engine onto the community corkboard, and if you have any questions, ask them below in the comments or in the forum. I am always here to help make your science dreams a reality. This looks like a fun (and not too dangerous) project. How big do you think the hole in the lid would have to be for this not to work? And would a pin-sized hole be too small? 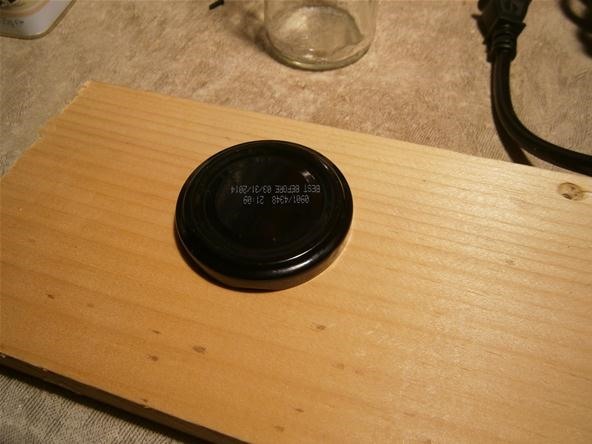 Generally the hole should be about the size of a penny, depending on the size of the jar. Love the article! I made a giant metal one similar to this, that could run continuously off propane. They're so loud! Pin-sized is too small. Mine was less than half an inch across. The really fun part is to experiment with different sized holes and see how much flame you get. Hmm... ideas of using a larger jar and making a flame tornado! That sounds amazing. Be safe and take video! Quick question... you say that antifreeze is almost pure methanol. Is it just the Heet brand gas-line antifreeze then? When I think of antifreeze, I think of engine coolant. And most of today's engine coolant skips methanol in lieu of ethylene glycol. So, that wouldn't work, would it? What I need to get is fuel-line antifreeze that specifically states that it contains methanol, right? Which I guess would be a good thing anyway, since a small bottle of fuel-line antifreeze is way cheaper than a jug of engine coolant. Yup! You are correct. Get the Heet. It's less than two dollars at my local hardware store.